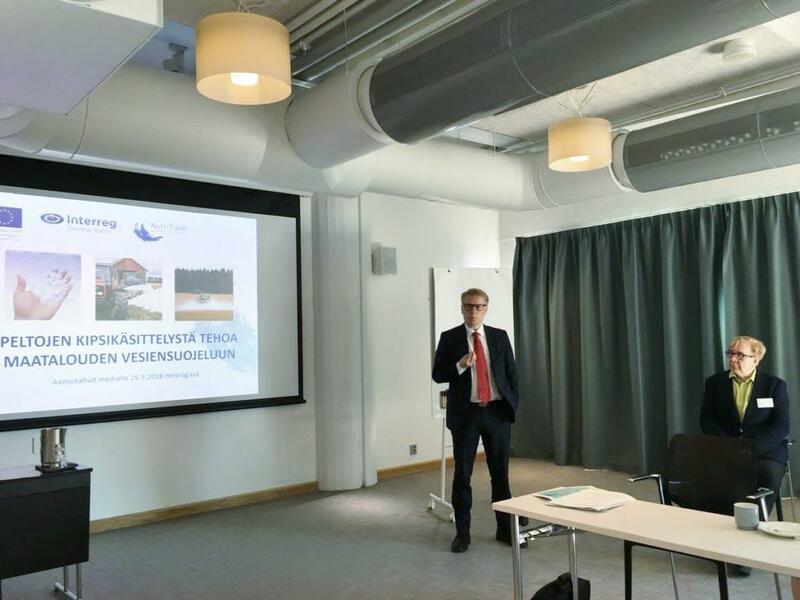 The University of Helsinki arranged a press conference on Pilot Gypsum back-to-back with the NutriTrade Final Seminar in Clarion Hotel Helsinki on 25th of May 2018. The media representatives were invited to a morning coffee to hear and discuss about gypsum amendment of fields as a new measure for the Baltic Sea protection. 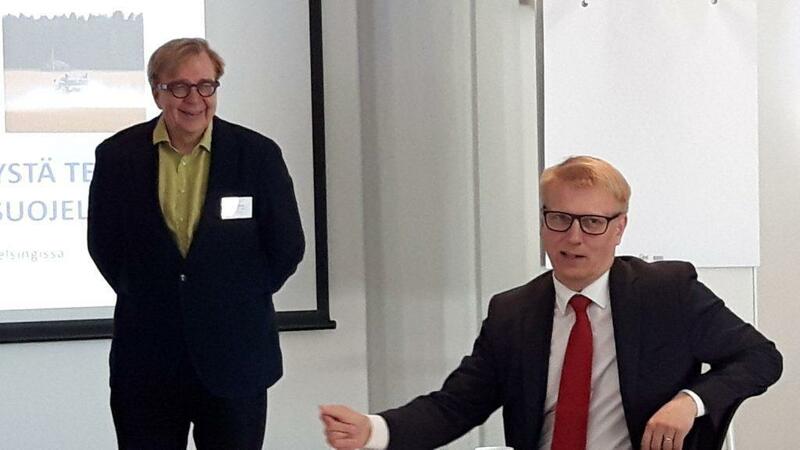 Finland’s Minister of the Environment, Energy and Housing, Mr. Kimmo Tiilikainen attended the conference and commented on the results of the gypsum project. Gypsum amendment was introduced as one of four innovative solutions in the NutriTrade project. Gypsum amendment has been tested in a large-scale pilot organised in southwestern Finland since autumn 2016. Media was invited to hear about the experiences gained and the results derived from the pilot, as well as plans and recommendations for the future. The project team, project coordinator Eliisa Punttila and prof. Markku Ollikainen, as well as senior researcher Petri Ekholm provided illuminating presentations of the results. Briefly, gypsum amendment has reduced the phosphorus load from treated fields by half. Costs per reduced kg P are only 70 €, indicating that gypsum is currently the most cost-efficient short-term method to reduce phosphorus loads. No harmful effects have been found in soils, yields or in the examined features of aquatic biota. Large-scale use of gypsum would enable Finland to meet the goals, defined in the HELCOM’s Baltic Sea Action Plan, for reducing the phosphorus load entering the Baltic Sea. Because gypsum amendment has a large potential in water protection throughout the Baltic Sea area, the method was proposed to be included in the HELCOM’s recommendations and national agricultural support schemes in the EU member states. “A large-scale pilot was performed successfully on a tight time schedule and the results are already to be seen. The expected water quality benefits are likely to be achieved. Also, the large-scale use has been shown to be a feasible operation, although not necessarily an easy or problem-free one. Now that we have this kind of a tool for water protection available, we cannot afford to ignore it”, said Minister Tiilikainen. Minister Tiilikainen indicated that gypsum amendment should be included in the agricultural support system for the next period starting in 2020 in order to reduce nutrient loads from agriculture on a large scale. During Finland’s presidency of HELCOM, the BSAP will be updated. Minister Tiilikainen warmly supported the proposal to include gypsum amendment in the list of HELCOM’s recommended methods. As a conclusion, he said that gypsum amendment is perhaps the most remarkable water protection measure in agriculture at the moment. The media representatives provided comments and concerns from many angles. For instance, gypsum has been negatively presented many times in the news due to phosphorus leakages from by-product gypsum piles. The project team cleared that in the Siilinjärvi factory, where the gypsum is supplied from, the gypsum pile is isolated from the surrounding water systems by a closed hydrologic circulation, and the remaining phosphorus is collected and utilised. The media representatives paid attention to the logistical challenges and the availability of gypsum in case of large-scale use. In large-scale use, the operation would be divided in parts by catchment areas and distributed for several years. The operation would also require an EU-wide tendering. 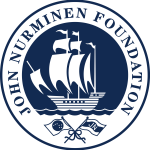 *Pilot gypsum as a part of the Project NutriTrade is financed by EU Central Baltic program and aims at developing the method as an innovative concept for the Baltic Sea protection. The pilot is also involved and the scientific research is done in the project SAVE, a Government key project, financed by the Finnish Ministry of Environment.